On Saturday November 11, I found myself transported into a familiar and surreal world. I was in the world of Kansas City Comic Con, a world of light, color and sound, with creativity abound. This year marked my second year at the convention, so I had an idea of what I was walking into, and I wasn’t as bowled over as I was in the summer of 2016. I knew what to expect, an assortment of cosplayers, a collection of comic book artists and, of course, one of the main draws with any convention, the celebrity guests. I looked at the list of guests, and there wasn’t anyone I was just dying to see and get an autograph from this year. I took note that Burt Ward, Lee Meriwether, and Kevin Smith were there. Meeting James O’ Barr last year was the highlight of the convention for me. I regard him as a living legend, and I consider “The Crow” to be the greatest independent series ever made. Having him sign my copy of “The Crow: Special Edition” was a bucket list item moment. There was nothing this year that was as significant for me. 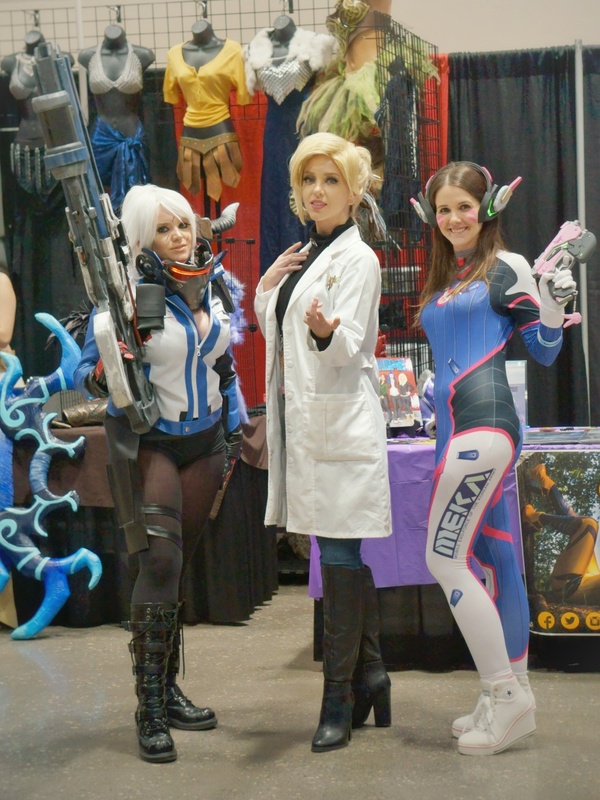 A variety of genres, mediums and art forms were on display, anime, cosplay, even horror. The con is not insular. A big tent welcoming feel is present. I made my way up the escalator to the showroom floor of Bartle Hall. I heard an amplified voice. It sounded like a carnival announcer. It was a ring announcer. A new edition to the convention was a live stage, and I had just walked upon a series of exhibition matches put on by KCXW, an upstart independent Kansas City, Mo.-based wrestling promotion. I decided to check it out. I arrived as a female wrestling match was about to begin. The combatants in the squared circle were Renee and Sabra Black. I thought wrestling did indeed fit in this environment. With wrestling you have a hero and a villain, referred to as a heel and a baby face, in a struggle, trying to defeat the other. Does that sound familiar? I felt the same sensory overload being at the convention last year. I took a stroll drown some of the aisles looking at original prints by artists. I took a walk around the perimeter then made my way downstairs to the conference rooms. I was a man on a mission, going into this year’s edition with the aim of covering panels. The first panel I attended was with an artist and writer from “Batman: The Animated Series.” You could feel the excitement and interest in the room. I did watch the show as a kid in the ’90s, so I found the panel conversation riveting. Just hearing them talk about the behind the scenes creative process flooded me with memories. I think that’s part of the appeal of a panel, to get information and communicate with someone whose work you’re a fan of. The audience engaged with the panel, providing questions and commentary, and I witnessed individuals in the audience who were erudite and knowledgeable about the subject. I noticed some of these thought provoking questions and comments coming from teenagers, often in cosplay. My ears would perk up when they would speak. Years later, I was able to figure out my dad’s underlying motivation in giving me comic books – it was to get me literate at a young age. From there, I started reading science fiction and fantasy novels and anything else I could get my hands on. A trajectory was established, and a love of reading soon fostered a love of writing. Diving into this material fulfilled another need, intellectual stimulation. Some could see this as unhealthy escapism. That is a legitimate concern if someone is not able to differentiate between fantasy and reality. If someone spends a lot of time in worlds of imagination, this can feed one’s immigration and future creative endeavors. As I looked upon the mass of attendees, I couldn’t help but notice creativity abound. When I heard energetic young people adding to conversations in panels steered by adults, I couldn’t help but feel like I was watching a preview of the future. How many young future web developers, or game designers, or film-makers, or costume designers were in the building? If their current energy and trajectory is maintained and built upon, I would guess quite a few.